Yes, they have chess in Iraq as well! A FIDE chess news report states GM Merab Gagunashvili has won the Iraq Chess Open 2014 that was held from March 22-29. He tied for first and shared the prize money, but took the trophy on tiebreak. Both Gagunashvili Merab and the young Egyptian IM Hesham Abdelrahman tied for places 1 – 2 and thus split the $ 5500 equally. The event featured once of the biggest prize funds in the Middle East. The third edition of the event included participants from 16 nations (28 title holders). 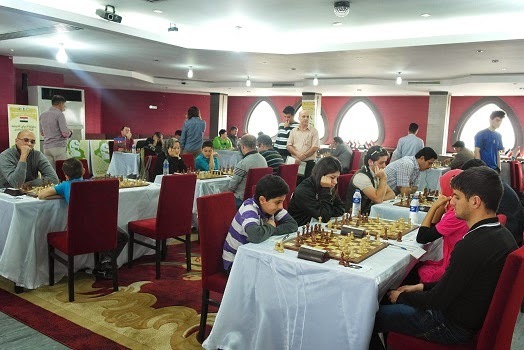 The chess tournament was hosted at the 5-star Al Mansoor Hotel in Baghdad. At stake was a total Prize Fund of US $ 20000 with winner taking the US $ 3000. Headed by GM Tarlev Konstantin of Ukraine and GM Gagunashvili Merab of Georgia, the 9 round Swiss witnessed tough competition.